SONIC Drive-In Adds New Footlong Philly to Bring Another Classic to the Car | Sonic Corp.
OKLAHOMA CITY--(BUSINESS WIRE)--Oct. 3, 2018-- SONIC® Drive-In (NASDAQ: SONC) is adding a beloved Philly staple to its robust menu with the Classic and Spicy Footlong Philly. With a footlong full of irresistible flavor, SONIC guests will be able to indulge in a bold and tasty cheesesteak in a whole new way at their favorite drive-in. Guests can choose from the Classic Footlong Philly or zest it up with the Spicy Footlong Philly, both of which become more irresistible with each bite. The Classic starts with hearty, grilled steak and onions topped with melty cheese sauce, all nestled in a fluffy bun that soaks up all the savory juices. For those wanting an extra kick, the Spicy Footlong Philly has sliced jalapeños and a zesty Baja sauce. 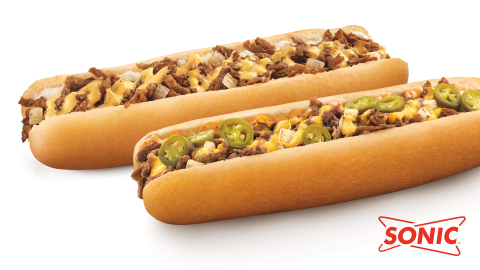 Starting at $3.99*, SONIC’s Footlong Philly is only available until October 28, while supplies last**. **For a limited time only at participating SONIC® Drive-Ins. See menu for details.